Mom..you do it ALL. 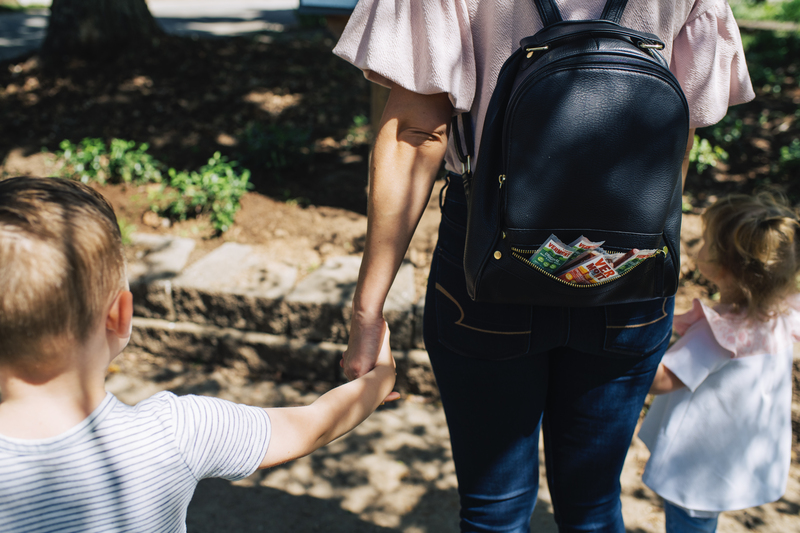 Especially when it comes to Back to School, you suddenly become “Supermom.” Juggling school lunch prep, after school snacks and meals, homework help, getting all the kids on and off the bus, school sports, and EVERYTHING ELSE, is an impressive feat for anyone. Nevertheless, somehow, moms (and dads!) all over the world, do it Every. Single. Day. But amidst all the craziness, it can be hard to find a few minutes just to breathe and relax. We’ve created three healthy but indulgent lunches you can bring to work to help you enjoy a few minutes of bliss among all the insanity. Images of ornate smoothie bowls infiltrating your Insta Feed may have you dreaming of the days you were only cooking for 1. But fear not – with some time saving tips, you can make a smoothie bowl every bit as decadent. To make this smoothie bowl, we used a premade fruit blend, so all you have to do is pop it into the blender with your favorite smoothie liquid (almond milk, coconut water, OJ, etc). We cut up some fruit for the kiddos in the morning and added the extras to the smoothie bowl. The smoothie bowl is topped with a crumbled Health Warrior Bar and chia seeds. 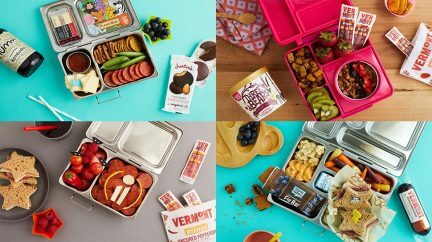 For some extra protein, we added trail mix and our Original MINIs. YUM! The lunchbox of all lunchboxes…THE CHEESEBOARD IN A LUNCHBOX. What do we love most about this lunchbox? 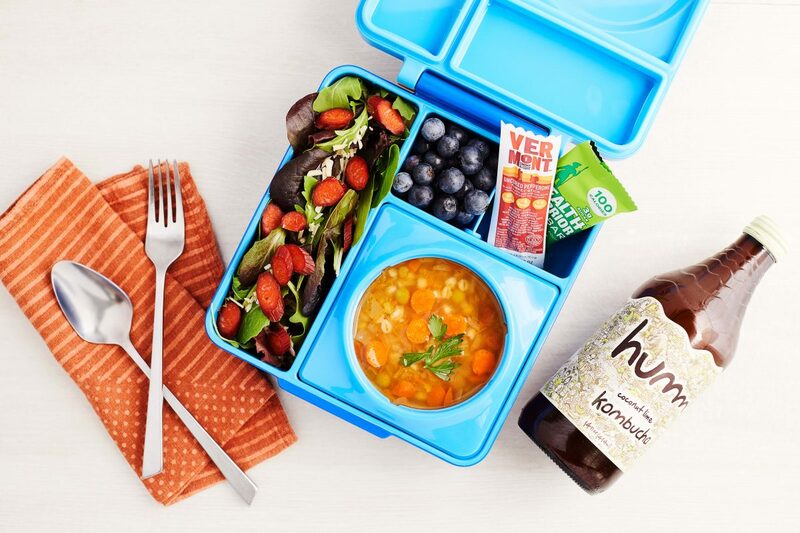 It looks like a special meal, but it only takes under ten minutes to pack. With all the craziness of back to school you can sometimes feel underappreciated, which is why it’s so important to create little moments where you can appreciate yourself! 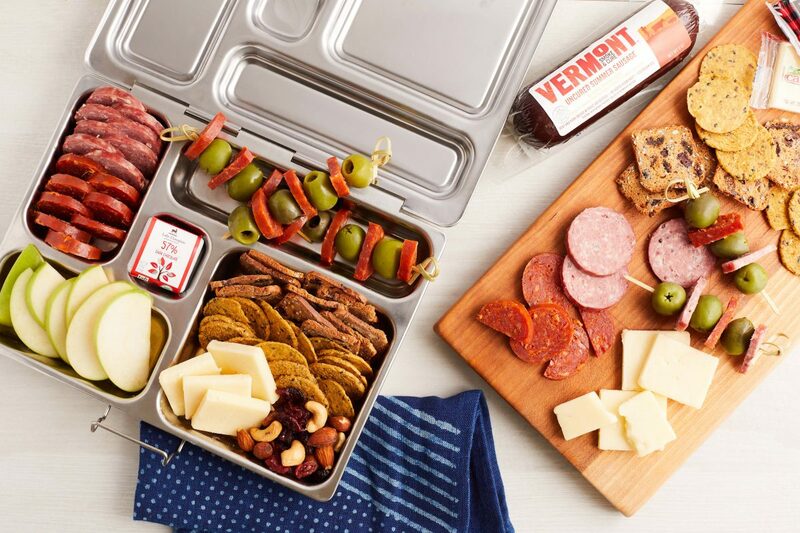 Just slice some Summer Sausage, Smoked Pepperoni, Apples, and pack your lunchbox high with these pre-sliced accoutrements – crackers, Cabot Singles, and a Lake Champlain Chocolates square. TREAT YO’ SELF! Another simple lunch that FEELS extravagant. 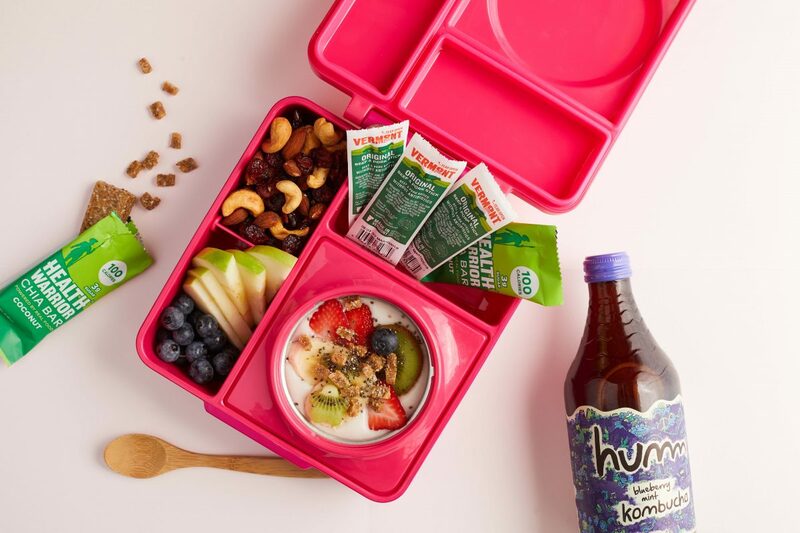 We popped in our favorite Amy’s soup into the thermos compartment of this Omielife lunchbox (no need to microwave again – the compartment will keep the soup hot all day long.) The soup is paired with a simple salad of dressed greens, tossed with parm and sliced Turkey Pepperoni MINIs. We added some fruit and Health Warrior bars for a low-calorie dessert. As always, making packed lunches realistic is all about prepping before time. 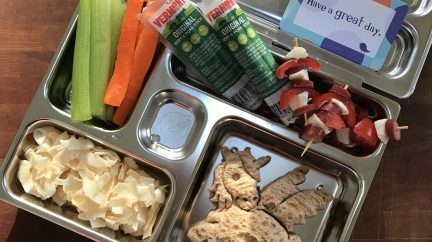 Much of the prep required for these lunches can also be used to pack your kids’ lunches or after school snacks. 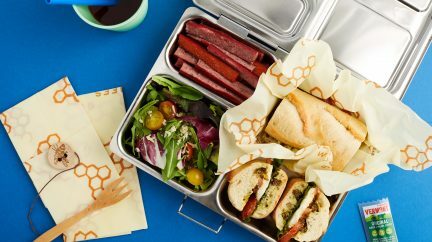 What are your favorite tips and tricks for prepping lunches ahead of time?